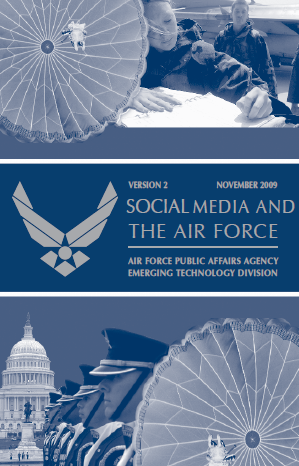 This guide provides Air Force Public Affairs professionals with basic social media knowledge needed to maneuver in the online information space and the basic-level tactics explained here should be used to compliment the traditional forms of Public Affairs, to include internal communication, community relations and media relations. Don’t divulge classified, FOUO or sensitive materials, photos or video. OPSEC is crucial to our mission, think before you speak or film—if you’re not sure, ask someone! A harmless video of an Airman dancing on the flightline could be sensitive if it’s a deployed environment showing bombers on the flightline. Be smart. Security is at the source. If you’re an aircraft mechanic, you’re well suited to communicate messages about aircraft maintenance. If you’re an aircraft mechanic blogging about legal issues—reconsider your blog. Credibility is critical, without it, no one cares what you have to say…it’s also punishable by the UCMJ to give a false statement. Yes, tell them what YOU think…just make sure you state that this is your opinion and not that of the organization. 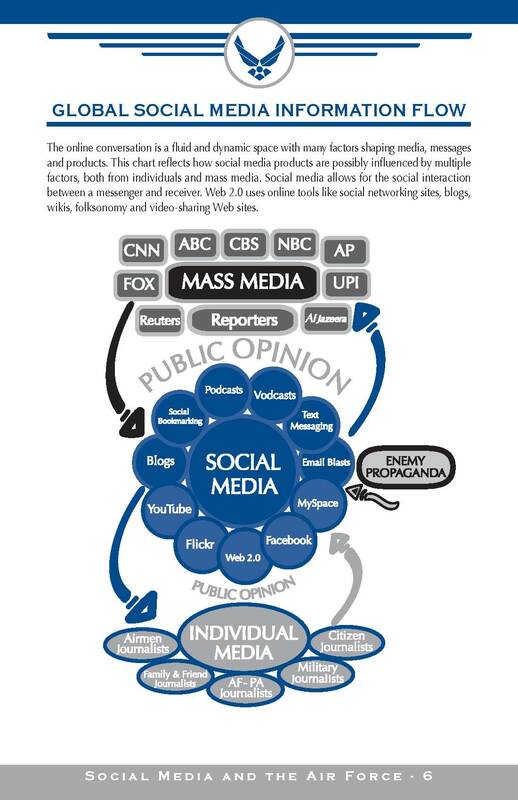 Also, be sure to identify what is your opinion and what is factual. Identification makes your post more credible. Videos that get widespread attention, or become “viral,” feature death-defying stunts or acts that are considered “extreme” in nature. Don’t let the desire to get your message across compromise your consideration for safety. If using a visual medium, don’t let your message get overshadowed because the viewer’s attention is drawn to your improperly worn uniform or something occurring in the background. The image you present will set the tone for your message and often mean the difference of whether or not people listen to your message. Your tactical representation could have strategic and international consequences for the Air Force and the nation. This is the bottom line. If you wouldn’t say it in front of your mother, you probably shouldn’t say it on YouTube. Realize that your words and images will go out to thousands and possibly millions of people around the world instantly and once it’s out there, it’s out there for good. Your unit Public Affairs shop should always be a source of advice and guidance in this medium. Also, be careful what personal information you divulge, such as address, phone numbers or any information that could aid identity thieves or the enemy. Military life often deals in ambiguity: In order to make the best decision, it’s recommended to take in as many variables as possible in order to make the most accurate decision. The enemy is engaged in this battlespace and you must engage there as well.